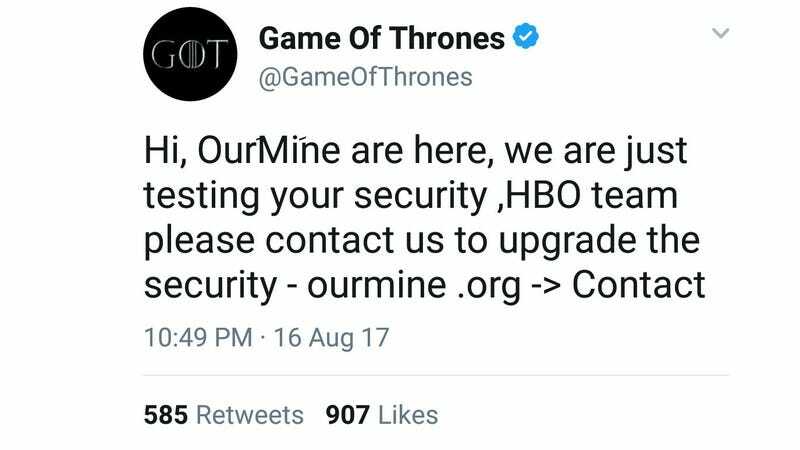 “HBO team please contact us to upgrade the security - ourmine .org -> Contact,” the hackers added. OurMine has a history of targeting everyone from corporate CEOs to BuzzFeed. It says it is a white hat group, though it usually tries to hit up its targets with a sales pitch. There’s no good day to get hacked. But HBO is already dealing with a multi-week standoff with a team of extortionate hackers who have begun releasing episodes of shows like Curb Your Enthusiasm—the length of which has clearly left the company very annoyed—and episodes of Game of Thrones continue to leak online. Given that, it’s safe the company should have been and probably was on high alert for any other possible security holes. So this is a terrible, horrible, no good, very bad day to get hacked. Maybe HBO should just release the rest of Game of Thrones now to get the monkeys off its back. Come on. Do it. You know you’ll feel better. Bronn would want you to. Gizmodo has reached out to OurMine, and we’ll update this post if we hear back.